"A mind all logic is like a knife all blade. It makes the hand bleed that uses it." 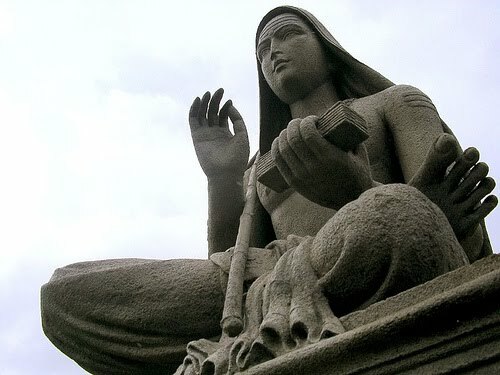 Once in ancient India, a young student named Shankara wandered from city to city looking for a teacher of wisdom who could help him on his path to enlightenment. Along the way, a great Swami named Govindapada Acharya recognized the brilliance of this young boy of 8 years. But first, the Swami decided to test Shankara by asking him a deceptively simple question: "Who are you?" In response, the boy replied in six verses of improvised poetry. Today these verses are known as the Nirvana Shatakam - or The Six Verses of Liberation. nor ego, nor storehouse of past memories. I am something beyond that. love and pure formless awareness. nor the layers of being (from physical to mental to spiritual). procreation, motion, grasping, or speaking. no feelings of envy or jealousy. nor desire, nor even need for liberation. I have neither merit, nor demerit. the process of observing, or object being observed. as I do not have death. nor have I discrimination on the basis of birth. I have no father or mother, nor did I have a birth. nor the guru, nor the disciple. I am without any attributes, and without any form. I have neither attachment to the world, nor to liberation. everywhere, every time, always in equilibrium. This is where ideas come to network. Browse insights with a balanced blade and grip. Written by Ravi S. Kudesia. Post 1: Marketing Made Simple. Post 2: The 10 Greatest First Lines. Post 3: What Buddha Doesn't Know. Olin Business School: Researching decision making, leadership and innovation as a PhD candidate in Organizational Behavior. The Leadership Yoga: Helping innovators of the world rise above it. Achieve success through the practice and philosophy of yoga. Youngry.com: A celebration of every aspect of the infamous entrepreneurial lifestyle told through the eyes of those living the dream. Wiley: Innovators Love Yoga And You Should Too. CNN.com: Can Yoga Solve India's Caste Problem? Ezinearticles: 9 Qualities of Effortless Leaders.